Understanding your appliances isn't exactly rocket science, but it can get more complicated than many homeowners care to admit. Is your food spoiling because your fridge is on the fritz? Or did you just pick up a bad cut of meat? There are many variables that can get confusing when you're trying to make sense of your fridge's symptoms, which is why it's important to know the nuances of this appliance. Here are some tips on how to figure out if your fridge is on its last legs or if the problem is elsewhere. A little condensation is normal in the summer, but your fridge shouldn't be sweating bullets. Compact Appliance explained that if you think your fridge has too much condensation on it, check the rubber seals around the door. Water droplets or signs of mildew signal that the appliance isn't cooling properly and needs to be fixed. If you spot droplets hanging on the bottoms of shelves in the fridge, the appliance may have a temperature problem. You'll want to check out the thermostat, otherwise your food may not be kept at an optimal temperature. Prematurely spoiled food can be a sign that your fridge isn't working properly – but it could also mean that the food you bought was bad. To figure out which case it is, check out the expiration dates on your spoiled ingredients. If the dates have passed, it might just be the food. However, if there's still time for the expiration period, your appliance may not be maintaining the proper coolness levels to preserve food. You may also notice that your electricity bill spikes, as the appliance may be using more energy to try to maintain a proper temperature. If you notice these signs, file a claim under your TotalProtect Home Warranty, and we'll send a pre-screened repair technician to identify the problem. 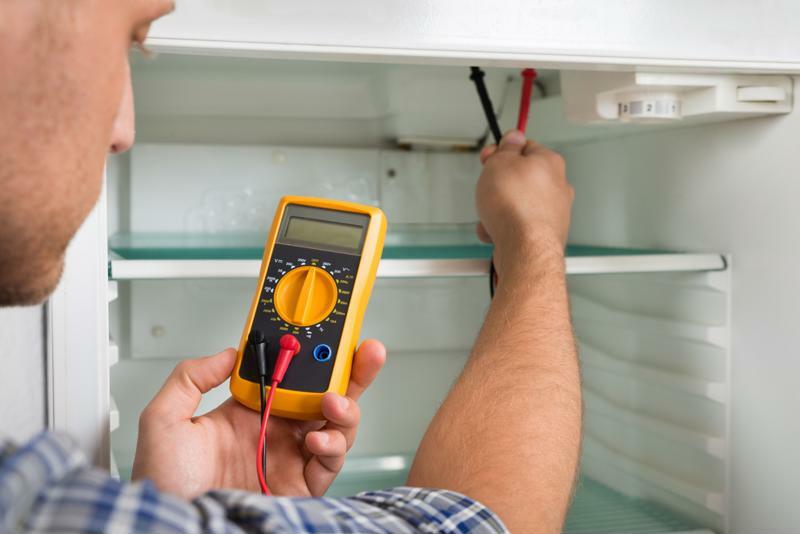 A repairman can check the thermostat in your fridge. Most appliances make noise when they're running – that's a given. However, as a homeowner, you'll need to become a pro at identifying which sounds are normal and which signal problems. Here's a breakdown of some of the most common refrigerator sounds. If you hear a boiling or gurgling sound coming from your fridge, there's no need to worry. Appliance411 explained that this is completely normal as refrigerant flows through the evaporator coil. On the other hand, if your fridge could serve as a metronome, there's likely a problem. A continuous ticking when the appliance is running could signal that there's an issue with the evaporator fan. There are a number of reasons your fridge may emit a snapping noise, most of which are completely normal. Some appliances snap when the cold control kicks on and off. The plastic liner of your fridge can also make this sound as the temperature adjusts, causing the plastic to contract or expand. It should never sound like there's a piglet caught inside your fridge. A continuous or intermittent squealing could signal a problem with the condenser fan, so make sure to file a claim with your TotalProtect warranty. Your fridge works by forcing cool air into the appliance, so it's very common to hear blowing noises coming from the machine. This may be the evaporator fan pushing air into the fridge or the condenser fan doing its job. As with any appliance, a rattling sound likely means that something is loose in your fridge. It could be the drain pan or some other essential component, so be sure to have this checked out by a professional. Follow these easy guidelines, and you'll be a pro at discerning your fridge's signals in no time.